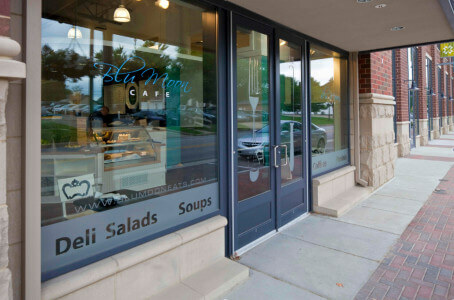 The Blu Moon Café offers fresh fare, such as paninis, deli sandwiches, salads, soups, specialty coffee drinks, breakfast and desserts (which include homemade ding-dongs). The café is open Monday through Saturday with indoor and outdoor patio seating. The owners, Brian and Shelley Jordan, are both culinary school graduates with a combined 30 years of restaurant experience, working with award-winning chefs in several of the best kitchens in the U.S.
Monday – Friday 7 a.m. – 4 p.m. The Indiana Design Center has event space that can accommodate everything from a 200-person gala to business luncheon. The Blu Moon Café is the preferred caterer for the building and works with event coordinators to prepare the perfect menu for a diverse range of occasions.